Pork tenderloin is a delicious and lean cut of meat that is simple to prepare. The easiest way to cook pork tenderloin medallions is on the stove top, and once you've mastered the cooking technique then you can adjust seasonings and sauces. Unwrap the pork tenderloin and place it on a cutting board. Using a very sharp knife trim away the thin silver membrane on the tenderloin, as well as any visible fat. Discard the trimmings. Hold the thick end of the pork tenderloin firmly with one hand. 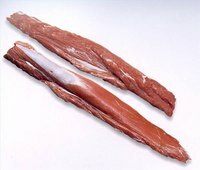 Using long strokes with your knife, slice the pork tenderloin on an angle into slices that are 1/2 to 3/4 of an inch thick. Set slices aside. Combine the flour, salt and pepper in the zipper bag. Toss lightly to combine. Add pork slices a few at a time and toss until well coated. Set pork medallions aside when coated. Preheat your skillet on a medium-high heat. Add the olive oil and butter, and let melt. Once the fats are bubbling, add the pork slices in a single layer in the pan. Be careful not to crowd the pan or they'll steam rather than brown. Cook for two minutes then turn the slices over and cook an additional two minutes. Remove browned slices of pork tenderloin onto a serving platter and continue to cook in batches until all the pork is cooked. Do not overcook pork as it will be dry and tough. Pork should be cooked to an internal temperature of 160F.